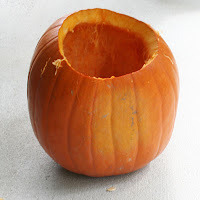 The Rainforest Garden: How to Make the "Gack O' Lantern"
First I'll show you how to make a pumpkin 'get sick', no purgatives required. You'll only need a pumpkin, a plant, a knife or two, a spoon, a plastic bag and newspaper. First, start out with a healthy pumpkin. He won't be so healthy when we're finished, but bear with me here. It helps if the pumpkin's on the taller side, since the mouth will take up a lot of room. You'll also want to pick a plant out before you get started, preferably one that lacks the typical leafiness that one would expect, since that would ruin the illusion! I used a type of rhipsalis, but you can use whatever is available. Sedum "Florida Friendly Gold" can be found at Home Depot, and it has a decidedly drippy and realistic look when used for this purpose. 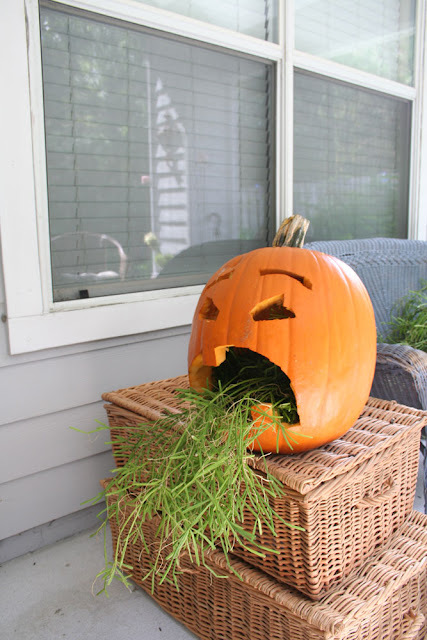 For another look entirely you can sprout some pumpkin seeds in advance and have them spewing out the mouth! Next, cut the top off, making sure to angle the knife inward so the top won't fall in. Then comes the gooey part. Pull all the seeds and loose pulp out. You can save the seeds for roasting or planting if you'd like. Using your spoon, scrape the fibrous insides out and set them aside. Now would be a good time to carve a drainage hole to discourage rot. 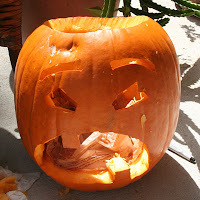 Thoroughly dry the pumpkin's insides, either letting it air dry or if you're rushed, filling it with crumpled newspaper. Then you're ready to carve the face! It helps to sketch it out first to perfect the pukey face. I went for a simplistic look, since I didn't want to distract too much from the fact that its spewing all over. Can't have that, now can we? Once the insides are dry, you can line the bottom with plastic. I simply recycled a grocery bag, pinning it in place with thumbtacks. Finally, insert the plants. This is really easy, and all I did was lay two pre-watered containers of the rhipsalis on their sides, inside the pumpkin, though you can also plant directly in the plastic lining. The plant will only need occasional watering. I also took cuttings and inserted them through the mouth and into the containers for a more tailored look. 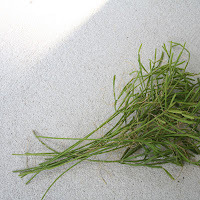 Here's my post on how to take rhipsalis cuttings. One last thing, and this is important. If the plant was shade grown, keep this out of direct sunlight! Congrats, you now have your very own purging pumpkin. - Go for a mad botanist theme this year! In the past I have collected red mangrove seeds from the beach and rooted them in a bucket. They were leafing out by halloween and I labeled them as 'Dead Man's Fingers'. Anything can be unusual if presented uniquely! - Use caudiciforms, or plants with grotesque and swollen trunks in your displays too complete the bizarre look! I also rooted a sweet potato in water (elementary, I know) for the same look, labeling it as 'devil's root'. - Forget having a haunted house, and opt for a haunted garden instead! use twine to train vines like moonflower over pathways so their tendrils can brush against terrified guests! Putting googly eyes on the plants is simply odd in daylight, but kinda creepy in the dark. - Think outside the pumpkin, and carve 'jack o melons' instead, or carving halloween motifs on papayas, eggplant and other fruit with an exacto knife. In Thailand fruit carving is a respected art form, and next Saturday I'll share some carved fruit of my own! 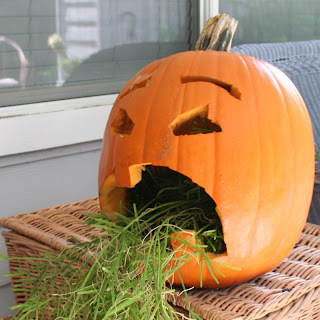 Until then, here's a funny video with watermelon carving gone awry. Ha love it! I should carve a pumpkin this year. Haven't done it for probably 5 years. Look out Martha here comes Steve! I love this. Especially the part about saving more candy for yourself! It was actually my first one, as you can see by the shoddy carving. Okay, maybe Martha would be disgusted to be mentioned, but she is a very creative person and my hero. You could also make spooky warning signs with a little pictoral showing a person impaled. That sould get the point across! I think this is the most good looking pumpkin I have ever seen! Very cool pumpkin and great idea! I saw a picture of a barfing pumpkin where they carved the face and then took the insides of the pumpkin, seeds and all had them half in and out of the mouth. Really gross but cool! I always worry about the kids around my one planter also. It has a big opuntia in it. Not big spines but ity bity.